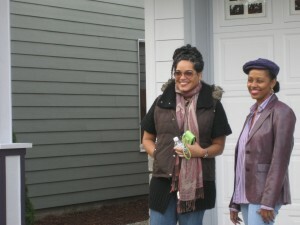 Home (Ownership) for the Holidays - Portland Community Reinvestment Initiatives Inc.
That’s what Rachel Allen, Portland Community Reinvestment Initiatives’ resident–or more appropriately, former resident–had to say about the day she received the keys to her new North Portland home. 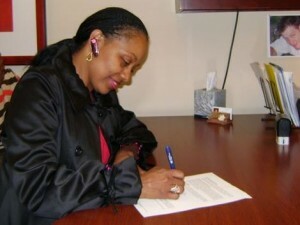 Allen (pictured above signing final documents) participated in PCRI’s Home Ownership and Individual Development Account programs to help her prepare for her “Welcome home” moment. While she says it’s hard to pinpoint a single most-helpful part of the program, she is quick to point out how it helped her better understand the process and the many pieces that make up the homebuying puzzle: Realtors, inspectors, lenders and mortgage brokers, to name a few. “You came out fully educated about the home buying process,” Fullwiley summarized. While education about home buying was a journey, Allen always knew her destination: a home in Portland’s north or northeast neighborhoods, close to family and with an easy commute to work. There were times when she wondered if, in order to afford a home, she would have to move further out, but with patience and persistence she found the home and location she wanted. Funches credits Allen’s focus and determination as defining assets. Combined with wisdom gained from the program’s classes and meetings, these assets were key to realizing her homeownership dream. In fact, Allen did get everything she wanted. Right down to the home’s deep purple trim paint–her favorite color. 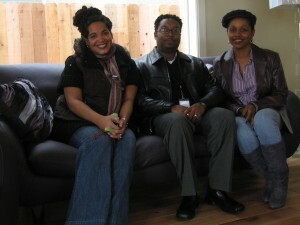 For Rachel Allen’s tips for first-time home buyers, check out our Facebook page (and become a fan! ).